The triple-imaged galaxy as seen by the Hubble Space Telescope. The peaks along the same wavelength reveal that they come from the same source. By looking far, far out into the universe, it is possible to see some of the earliest galaxies to ever form. Now, scientists have spotted a very early galaxy that's the faintest they have ever seen. The first galaxies to ever form in the cosmos lie far from the Milky Way (due to the expansion of the universe), making them a challenge to detect. Using a natural magnifying-glass process known as gravitational lensing, scientists have spotted one of the faintest of these early galaxies that they have ever observed. Scientists are seeing the galaxy as it appeared only a few hundred million years after the Big Bang kicked off the formation of the universe. "That shows how gravitational lensing is important for understanding the faint galaxy population," Huang said. All objects warp the space-time surrounding them, but the most massive objects, like galaxies and black holes, can distort space-time so much that even light is warped as it passes by. As a result, light from behind a massive object can bend around to the front and become magnified, revealing faint galaxies that would otherwise remain hidden. In the case of the newly observed galaxy, the warped space-time effect created three distinct images of the faint, background galaxy that scientists may be able to use to learn more about the early universe. "Because you see three of them and the characteristics are exactly the same, that means it was [gravitationally] lensed," Keck staff astronomer Marc Kassis, who assisted the discovery team, said in the same statement. The trio of magnified images first appeared in observations made by both Keck and Hubble. 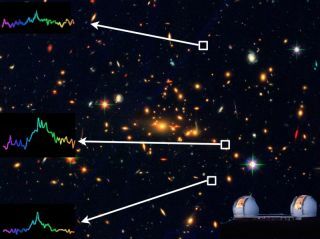 The team combined data collected by both telescopes to confirm that all three were the same galaxy. Seen as it would look when it was about 20 million years old, the dim galaxy is about 10,000 times less massive than the Milky Way. Its small size and young age make it a likely candidate for one of the galaxies that helped turn the lights back on after the dark ages of the universe. A few hundred thousand years after the Big Bang, individual particles in the universe joined together to form atoms, and the universe became transparent to some of the light created during the Big Bang (today, this light is known as the cosmic microwave background). About 350 million years later, radiation from the first stars and galaxies began to collide with those atoms, and release the individual particles once again. This process is known as reionization, and it provides a timeline for the formation of the first galaxies. According to the researchers, whose work was published in the Astrophysical Journal Letters, the objects responsible for kicking off this reionization were likely young, low-mass, and nearly dust-free galaxies similar to the one they discovered. "This galaxy is exciting because the team infers a very low stellar mass, or only one percent of one percent of the Milky Way galaxy," Kassis said. "It's a very, very small galaxy and at such a great distance, it's a clue in answering one of the fundamental questions astronomy is trying to understand: what is causing the hydrogen gas at the very beginning of the universe to go from neutral to ionized about 13 billion years ago. That's when the stars turned on and matter became more complex."